This is the fourth post in my series of Pre-New Year’s posts about how to start or increase healthy habits like hiking, healthy eating, yoga and meditation. I personally discovered yoga over a decade ago around 2007 and I was purely looking for a workout and/or physical benefits at the time. I started out with an elective class in college and then sporadically went to classes at local gyms if it worked with my schedule. I would also sometimes buy groupons and try a few classes at studios. It wasn’t until 2015 when I quit my job and ended an unhealthy relationship that I started going to yoga classes more regularly and started experiencing the other mental, emotional and spiritual benefits. Overall I felt stronger, healthier, calmer and more content with myself. 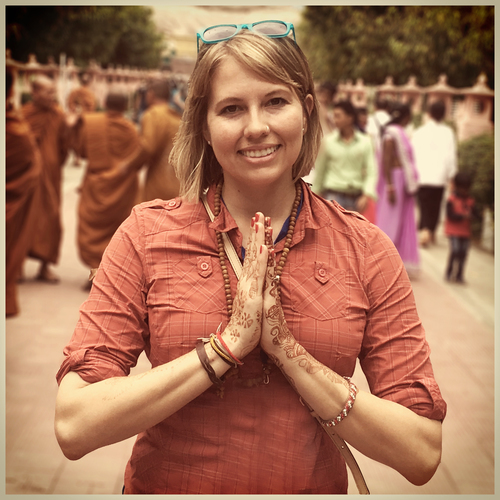 The insights I experienced thanks to yoga led me to do my 200 hour Yoga Teacher training in Southern India at Ayur Yoga Eco Ashram in traditional Hatha yoga so I could share the practice with others. I traveled, hiked and volunteered a bit more around Southeast Asia before returning home and teaching at a studio in South Carolina for about a year. I also completed a Yoga Internship and Spanish immersion in Medellin, Colombia. After exploring South America, I moved to Asheville, NC and started Namaste in Nature, which combined both my passions for nature and yoga. I also started teaching at Asheville Yoga Center, where I am also currently working on my advanced 300 hour teacher training. The best way to learn yoga is by doing it, but I totally get how it can be intimidating to get started. You don’t want to be the only one in class who doesn’t know what you’re doing. You wonder if you can keep up with the rest of the class. A lot of the words are in a foreign language. You don’t feel strong enough or flexible enough to practice yoga. Do you really need a bunch of expensive yoga clothes, mats and accessories to participate? I am a perpetual yoga student as well as teacher but I can assure you that there is some type of yoga for every body. I’ve answered some of the most common yoga questions and concerns below, which I hope inspires you to start or expand your own practice. I’ll also be releasing 30-ish minute yoga videos both here and on youtube in January that you can watch where or whenever you want! And of course if you have concerns, check with your doctor before starting any new type of physical activity. What is yoga & where did it come from? Yoga originated in India hundreds to thousands of years ago (there is some debate). The actual word is Sanskrit, meaning "to control", "to yoke" or "to unite". It is also sometimes translated to mean "joining", "uniting" and "union". The union refers to the connection made between the self and the spirit. Yoga is a major part of the Hindu religion, embodying their natural state of being and leading towards spiritual enlightenment. Yoga is used in conjunction with meditation, is often a major part of Buddhism and has even been linked to Islam and early Christianity. Today’s yoga in Western society is super popular, not so much for the spiritual benefits as for the physical advantages. You can take a yoga class at many local gyms, yoga studios or in the comfort of your own home. What do I need to start doing yoga? I love how minimalist yoga can be. All you really need is yourself, some comfy clothes, a few square feet of space and the only thing I recommend buying to begin your practice is a yoga mat. You can buy a cheaper mat to start and invest in a more expensive one that best meets the needs of your developing practice later. Most gyms and studios also provide communal mats to use when you attend group classes. There is no shame in using props when you’re getting started or even if you’ve been practicing for years! Blocks, straps, blankets and bolsters can help you attain a variety of asanas (poses) safely and securely. Most studios provide these and the instructors will let you know what you need to use before class starts. You can also buy props online and use them at home. Yes! You can watch youtube videos for free at home and if you follow local gyms and yoga studios on social media and/or join their email lists, you can find out about free and discounted classes. Yoga classes may also be included at the gym you already use. You may also find discounted class packages on sites like Groupon or LivingSocial, but these are often offered at the detriment to the studio. Group yoga classes generally cost $10 - $25 per class, depending on your location. Some studios are completely donation based or offer sliding-scale pricing to make classes more affordable. Single, “drop-in” classes generally cost more per class than buying a package of classes. Every studio is different so do some online research to see what’s available in your area. Private, one-on-one yoga sessions are offered by many yoga teachers and can take place at your home or in a studio. These range from $50 - $150 per session. These are more expensive to cover travel and prep time for a customized class just for you. Discounted private class packages are also often offered. Yoga can help increase your flexibility but you don’t already have to have a rubber band body or even be able to touch your toes in order to start doing it. Remember not to compare your ability or your asanas to anyone else in the class. Everyone’s body and yoga journey is different and everyone is in a different place with their practice. Sometimes it can seem like people are watching or judging you but 99% of people are focusing on the teacher or their own practice. Come to yoga just as you are without self-judgement or specific expectations and you will likely have an enjoyable experience. Where should I do yoga? If you have a hectic schedule and/or want to get familiar with the poses and terminology before doing yoga in public, you can buy DVDs or find an abundance of video yoga sequences on youtube. However, you’ll still want to get to a class with a live instructor very soon so you can learn good habits and prevent injury. The next step may be to look for classes taught at your local gym or YMCA or other community locations like libraries, churches and schools. This is a great way to meet other beginners and have access to a teacher who can guide you further along your practice. A yoga studio can be intimidating but growth always happens outside your comfort zone! Many studios offer free or discounted community classes and discounted intro class packages so you can try them out before investing a ton of time or money. This is where you are going to find the most variety of classes, teachers and workshops and really be able to dive into your practice. I recommend starting with one yoga class per week. Most classes are an hour (or more) but you can find quicker classes online that are 20 or 30 or 45 minutes to better suit your schedule or physical ability. It may help to make it a part of your routine and try the same time/day each week. Or, you can experiment with a different class each week to discover the one(s) you like. Some people practice yoga every day. Some people go weeks or months in between classes. How often you practice depends on so many life circumstances and it’s ok if you can’t make yoga one of your top priorities right now. The more you do yoga with an instructor, the more confident you will feel doing more yoga on your own, even if it’s just a few sun salutations or breathing exercises. How many times do I have to do yoga before I see results? This depends on what you think of as “results” like touching your toes, losing weight, increasing muscle tone, having a calmer mind, etc. I’ve found it’s best not to go into with yoga having super specific expectations, but instead be curious and see what happens. Maybe even journal about how you feel before and after yoga so you can look back it it later and compare. Yoga is like anything else, the more you practice it, the more proficient you will become. This is why we call it a yoga practice. Some people work up to a daily yoga practice. Is yoga good for older people? Yes! I firmly believe that yoga is for every body since there is no single definition of what your yoga practice should look like. Yoga poses and sequences can be modified for any age from children to the elderly. Typical props like blocks and straps as well as chairs and walls can help you explore your personal yoga practice. You may even be able to find classes in your area that are specifically designed for older people suffering from ailments like arthritis. Yoga is the best way I’ve found to become more aware of your body and what it needs to function at its best! Is there more than one type of yoga? Yes. There are several different kinds of yoga from a fast-paced, hot and sweaty classes to slow and relaxing classes with gentle movements and everything in between. Which kind of yoga should I do? "Hatha" actually describes all the physical practices of yoga. It is a very general term which can almost be used interchangeably with "yoga". When you do Ashtanga yoga or Iyengar yoga, you are doing Hatha. With a Hatha class, you can most likely expect a slow-paced yoga class with stretches and breathing exercises. The goal is for you to be able to learn to do and maintain poses and concentrate on your breathing. Even though the movements are slow, they are a great way to work out and relieve stress. Recommended for beginners and those who want to learn the basic poses and terms and try all kinds of different poses. Yin Yoga takes stretching beyond the muscles and is advocated by American teacher Paul Grilley. Poses (Asanas) are held for about three to five minutes at a time in order to the stretch the connective tissue around the joints and bring the practitioner to a state of mental calmness. Recommended for beginners and beyond, especially those who want a slower pace and healthy joints. Restorative yoga uses props like blankets, blocks and bolsters to support the body as it relaxes into poses over the course of several minutes. This practice encourages passive stretching. Typical asansas (poses) like seated forward bends, gentle supine backbends, and twists are examples of the type of poses that are adapted to be restorative. Recommended for beginners and beyond, especially those who want the most gentle practice and/or may have injuries or illness. Vinyasa is also called Flow because of the smooth way that the poses run together. This is one of the most popular contemporary styles of yoga. It's a broad term that encompasses many different types of yoga, including power yoga, Ashtanga yoga, etc. There is less time to rest in between poses compared to Hatha. Vinyasa allows for a lot of variety, but will almost always include sun salutations. Expect to move a lot, sometimes vigorously, from pose to pose. No two vinyasa flow classes will be exactly the same so it’s best to read the class description to see if it’s what you’re looking for: fast or slow, advanced poses, alignment-based, etc. Recommended for Beginner-Intermediate who want a smoother, slightly more challenging practice. Kundalini is a very old form of yoga, which has only recently been practiced in the West. Specific sequences of poses are performed together with certain breathing techniques, which intensify your workout. The sequences in Kundalini yoga (called kriyas) are rapid and repetitive. Kundalini also involves chanting a variety of mantras in Sanskrit. Recommended for beginner-intermediate students that have tried out a regular yoga class and want to raise the intensity with more challenging sequences, breathing and chanting. This type of yoga is well-structured and on the more challenging end of the spectrum. Ashtanga is comprised of six different sequences developed by Patabbhi Jois. Each sequence focuses on a different aspect of your body. For example: The first sequence, called Yoga Chikitsa, focuses on detoxification, strength, flexibility and stamina. It consists of 75 poses and takes between 1.5 to 2 hours to complete. It’s best to start with guided classes with an instructor but get the drift you'll be able to go on by yourself and practice without instructions, which feels great and can be VERY rewarding. Recommended for intermediate & advanced students who want a more athletic & advanced practice and to learn set sequences that you can practice on your own. Hot yoga is done in a humid room that is heated to 95-100ºF (40+ ºC). It is usually performed in a flowing (Vinyasa) style, so poses are smooth and linked together. Heat is used to loosen the muscles, thus promoting greater flexibility. Hot yoga is all about sweating and makes your body very, very warm, which may also stimulate fat burning rates. Side note: Not all hot yoga is Bikram yoga but all Bikram yoga is hot. Bikram yoga is a sub-type of hot yoga entailing 26 postures, that was invented and marketed by a yogi called Bikram Choudhury. Recommended for intermediate - advanced students who want to sweat! Of course there are many other sub-styles of yoga that you may want to explore including Baptiste, Iyengar, Sivananda, Moksha, Kripalu and Forrest. Click here to read more about these sub-styles. It’s normal to like some classes more than others so keep exploring until you find the styles, spaces, teachers and sequences that are right for you! How do I incorporate more yoga into my life? Yoga works best when it becomes part of your lifestyle, so work on incorporating it into other aspects of your life, including vacations! Try taking yoga classes in other cities, attend a yoga retreat or join us for an amazing yoga hike if you’re ever in Asheville, NC!